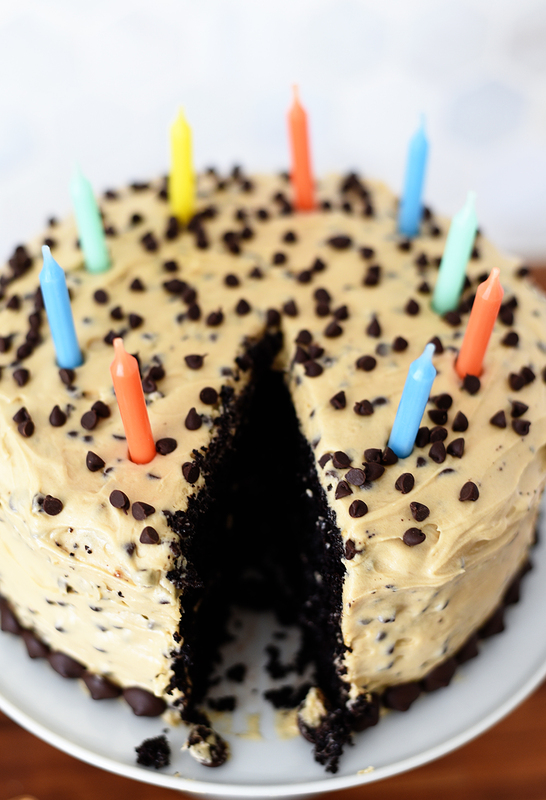 Chocolate Cake with Chocolate Chip Cookie Dough Frosting - Real life, on purpose. Evidently I’m on a chocolate chip kick this year. Two of the last three recipes I’ve shared have had chocolate chips in them. What can I say? I likes what I likes. Also I’m realizing I haven’t shared many recipes lately. I should get back to that. Food is my love language, after all. Anyway, since yesterday was our anniversary, we celebrated it the way we have for the last few years: with a family birthday party, complete with birthday cake and candles! It’s been such a great way to include the kids in the celebration. And I especially love that it takes the pressure off David & me to be romantic or fancy or whatever. I find I enjoy all holidays more when I remove as many expectations as possible and just enjoy the day for what it is. The girls tried to convince me we needed a colorful cake or something with berries on it, but this time I went with David’s current favorite combination. He’s big on rich chocolatey desserts, and dark chocolate cake with chocolate chip cookie dough frosting is definitely that. Plus it’s ridiculously easy to throw together for how impressive people think it is. I know people get hung up about raw eggs, but confession: that has never stopped me from eating too many cookie dough balls from the freezer. Fortunately, when you’re not planning to actually bake the cookie dough, you don’t need eggs. That’s why you can get chocolate chip cookie dough ice cream without worrying about salmonella: not a raw egg to be found. Same deal here. 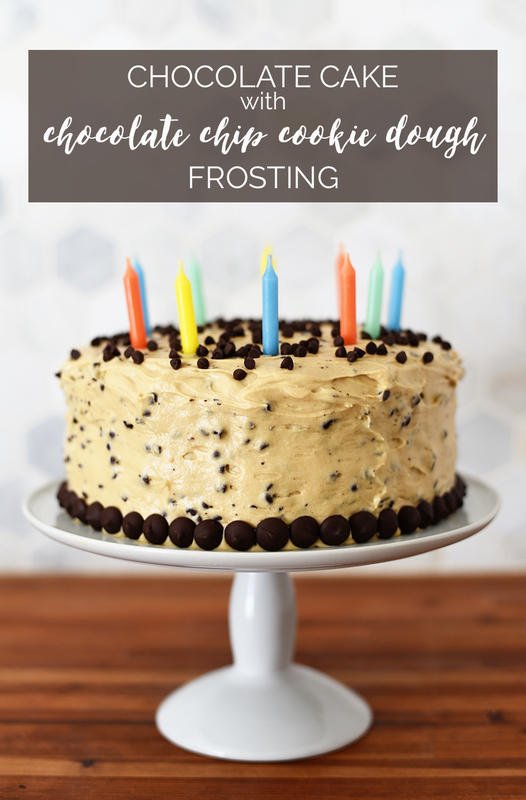 I’m sure any old chocolate cake recipe would make a great base for this chocolate chip cookie dough frosting. I used this one because it’s easy and because buttermilk cakes are my fave. You could even go with a box mix if that’s how you roll. 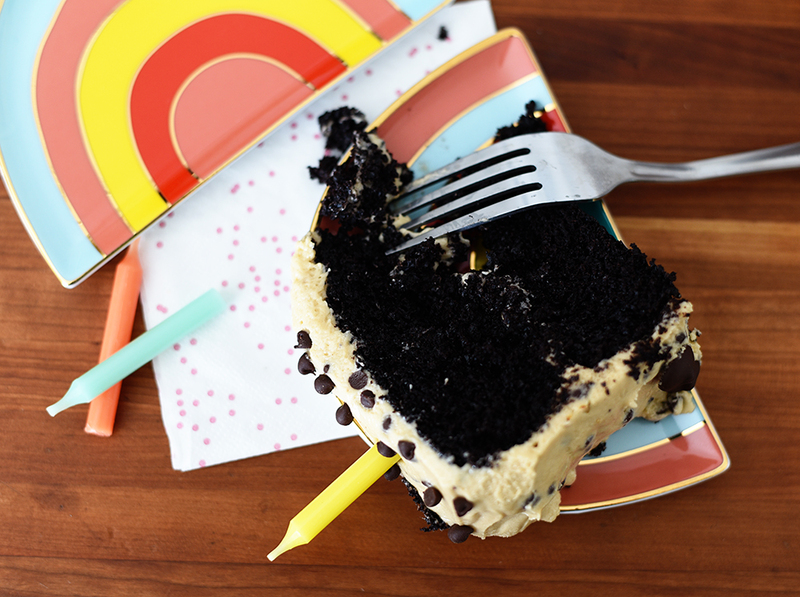 Box mix + homemade frosting is always a winning combination. Especially when it’s chocolate chip cookie dough frosting. I mean…come on. You know you want some. In a medium bowl with hand mixers, or in a stand mixer fitted with the paddle attachment, beat together butter, cream cheese, brown sugar, vanilla, and salt, and beat until well combined and creamy. Add 1/2 cup of flour and beat until smooth. Add a splash of milk and beat. Continue, alternating between flour and milk, until frosting is desired consistency. Stir in mini chocolate chips. 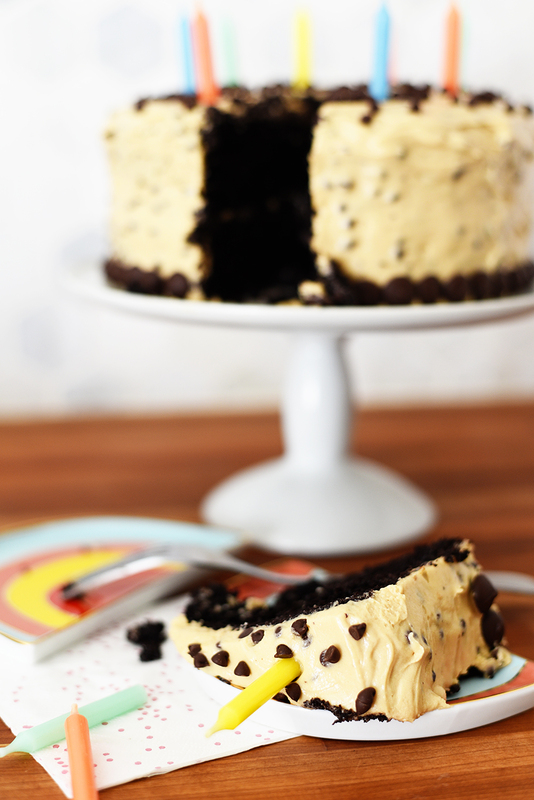 Frost cooled chocolate cake and garnish with chocolate chips. Serve immediately or refrigerate until serving.